It has been over 25 years since Cary Bates’ last Flash story was published in Flash #350, but his DC Retroactive: 1970s issue shows he hasn’t forgotten how to have fun with the Scarlet Speedster. 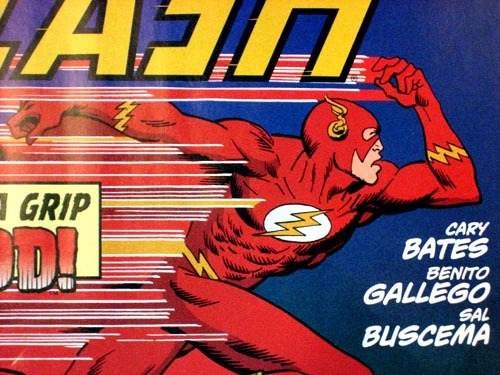 Opening with a page that would have been right at home in any Julius Schwartz-edited Flash magazine, Bates crafts a story that recalls his many years as writer on the book, while also addressing a lingering question regarding Barry Allen’s relationship with his wife Iris. The pitch-perfect plot and dialog give this book a place in the story of the Allens’ marriage. It could easily be slotted at any point during the early-to-mid 70s and would not feel out of place in terms of narrative. The artwork by Benito Gallego and the legendary Sal Buscema is great, and more than appropriate for this story. Based on the cover pencils, Buscema’s inks are a comfortable compliment to Gallego’s style. It took me a few minutes, but Gallego’s Flash and Barry Allen portrayals are occasionally reminiscent of Joe Kubert’s late-60s Flash covers. It is also easy to picture this story illustrated by the late, great Irv Novick, especially considering the pacing and structure of Bates’ plot. 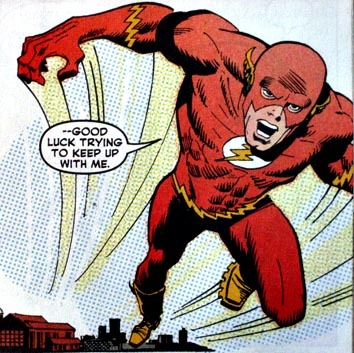 WARNING: The rest of this post contains spoilers regarding the events of DC Retroactive: The Flash – The 70s. Flash has discovered, through the aid of Solovar and Gorilla City-technology, that his super-speed is having adverse effects on his reproductive system. At that same moment, in Central City, Iris is shown apparently raising a child with super-gorilla Grodd. Using her DNA to create a human/super-gorilla hybrid “son” named Darok, Grodd counts on Iris’s maternal instincts and uses his own force-of-mind powers in an attempt to drive a wedge between Iris and Barry. He also enlists a reporter to write a story about the Grodd/Iris family unit, planning to use the story as an opportunity to reveal Barry’s secret identity. Complications arise when Grodd introduces Barry’s DNA sample to the matrix, and uses it to accelerate Darok’s rate of maturation. This addition proves harmful to Darok, causing him to age at the same pace. Once Darok learns of the nature of Grodd’s plan, he “kidnaps” Iris to stage a conflict. Flash and Grodd join forces, justifying a truce based on a mutual interest in containing the “Son of Grodd”. As one of the all-time Flash writers, Bates’ plot and story smack of the fun and adventure of the 1970s Flash, particularly the Schwartz era. He confirmed as much in our interview with him, and mentioned to Newsarama that the plot was turned in within one day. Gallego and Buscema produce artwork that more than fits the bill, and manages to recall the work of yesterday’s Flash artists. 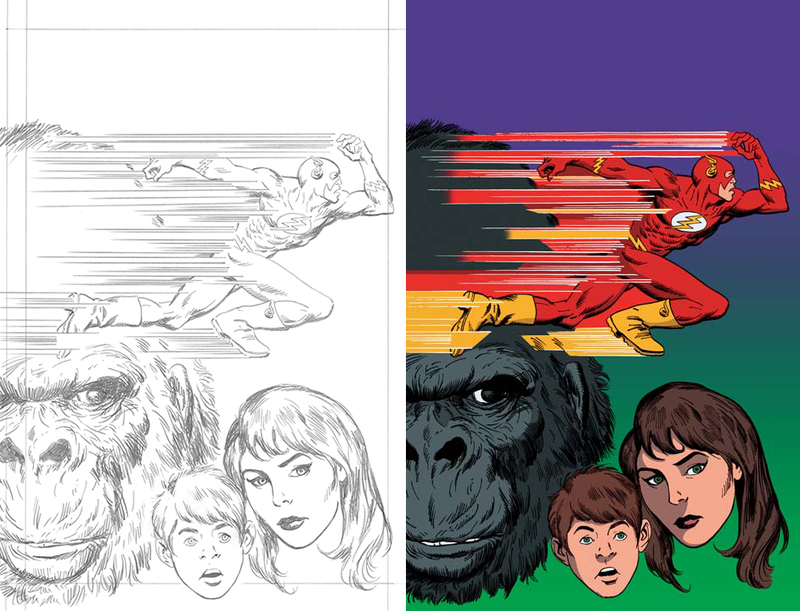 Any reader with a taste for Silver and Bronze Age DC Comics will enjoy this return to the Flash of the 70s. The book succeeds as a fun, touching look at parenthood and the many ways a family can (and cannot) come together. The backup story is DC Comics Presents #2, by Martin Pasko, Jose Luis Garcia-Lopez and Dan Adkins. 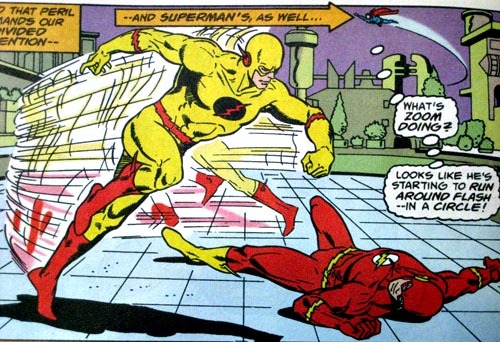 It features the second half of a Superman/Flash team-up/race. I love this issue. It is a DC classic and features absolutely drop-dead gorgeous artwork. It has Professor Zoom, Superboy and the Legion, time travel, alien worlds and is overall one of the most satisfying Flash-related tales of its time. It is also a really odd choice for this issue, since it is not technically a Flash story, is not by Cary Bates and has been reprinted twice in the last six years. I really enjoyed how this story addressed an in-story question (why Barry and Iris didn’t have children during this period), but didn’t impress an answer onto Flash history. It fills in a blank while hinting at an eventual resolution and acknowledging that Barry and Iris eventually did have offspring in the form of the Tornado Twins. 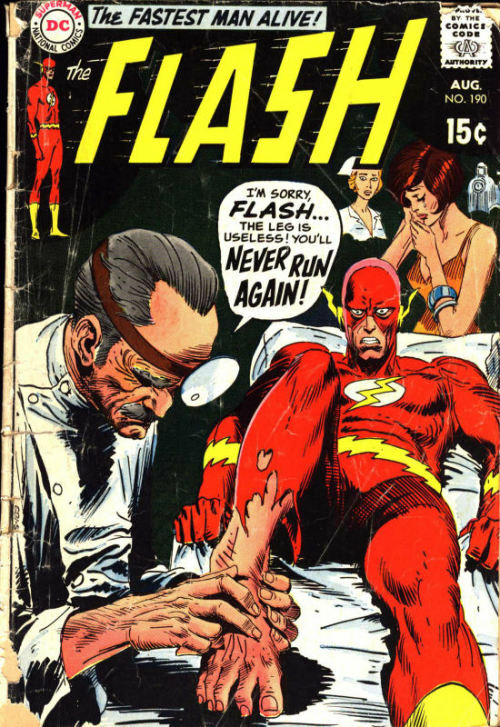 It’s also interesting to see a very real, human problem at the root of this kind of Flash plot. It allows Bates to use the formula of the past, but changing a root to tailor it for modern audiences. As a result, the storytelling style is not jarring in the least, and in some ways is an innovation. It at least showcases the timeless strengths of the formula used for so many years. Also, it’s nice to see a problem that Gorilla City can’t solve. This entry was posted in Reviews and tagged Benito Gallego, Cary Bates, DC Retroactive, Sal Buscema on July 26, 2011 by Greg Elias. 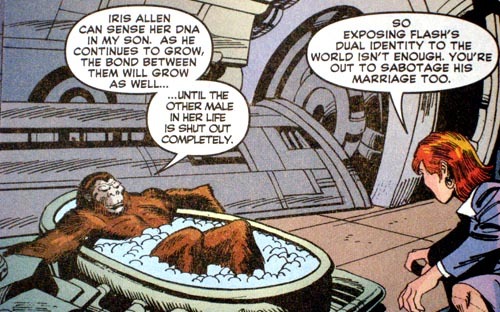 I got my money’s worth just with the picture of Grodd in the tub. I thought they did a good job capturing the feel of the era. I had not noticed, but just checked looks like it was to be Flash #210: http://dcindexes.com/database/story-details.php?storyid=24985 …that would have been much more appropriate, and a bold choice at that.